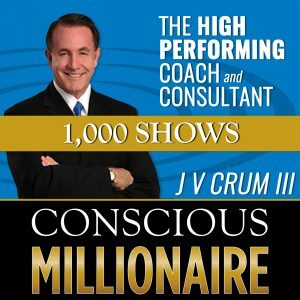 Named by Inc Magazine as one of Top Business Podcasts to listen to in 2017, JV Crum III is Host of the Conscious Millionaire Show, a Podcast and Nationally-Syndicated Radio Show heard by over 12 Million listeners in 193 countries. JV also hosts “Marketing for Business Coaches and Consultants,” which is a Podcast, Nationally Syndicated Radio Show, and WebTv production on which he interviews the top marketers in the world. A best-selling author of what became the #1 book on all of Amazon, hitting 34 #1 positions in different categories simultaneously; he is an avid blogger at ConsciousMillioanire.com and has a column at the Huffington Post. JV’s seminal book is “Conscious Millionaire: Grow Your Business by Making a Difference.” He is also the author of 14 other books, many of which are sub-books based on the original book. Podcast Topics: Sales, marketing, PR, strategy, social media and the like, personal growth and development, or transformation and mindset. Ideal Guest Avatar: (1) successful business coach or consultant (2) expert including authors and podcasters who have a specific product, service, or process designed to help established business coaches and consultants grow their businesses – including experts in sales, marketing, PR, strategy, social media and the like (3) experts/authors on mindset and personal growth/development or transformation.